An ancient game from Egypt. A game board of 5x5 squares. Take it in turns to place two stones at a time on any two vacant squares, except for the central square which is left empty to begin with. When all 24 stones have been placed the player placing the last couple in position begins the second stage. A stone can move at right angles (but not diagonally) into any adjacent empty square including the centre one. A stone is captured and removed from the board when an enemy stone is moved alongside trapping it by two enemy stones, one on each side. 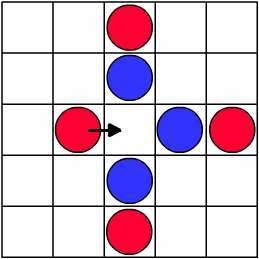 In the diagram, when the red stone is moved as shown, it captures all three blue stones simultaneously. After making a capture a player can continue to move the same stone as long as it makes further captures. Safe ground: a player can safely move a stone between two enemy stones and a stone on the central square cannot be captured. When a player cannot move the opponent must make an entry by taking an extra turn. The winner: a player wins outright if he can capture all the enemy stones. Each player may make a barrier behind which there are only his own pieces and these can be moved without fear of attack. The initial placing of the stones is important in planning such a barrier or in preventing the other player from making one. If a barrier is set up, then the player with most stones on the board wins. If they have the same number of stones on the board the game is drawn. The board may be increased to 7 x 7 or 9 x 9, each of you then has twenty-four or forty pieces. Real world. Nets. Interactivities. Networks/Graph Theory. Mathematical reasoning & proof. Cubes & cuboids. Games. PrimaryGames-Strategy. Working systematically. Visualising.